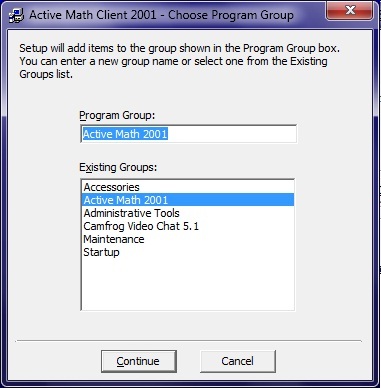 Active Math will run on any 32bit version of Microsoft Windows, from Windows 95 through to and including Vista and Windows 7. 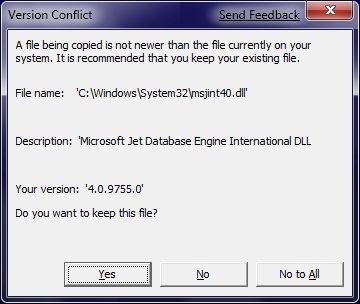 However, when installing on Windows XP, Vista, or Windows 7, take care not to overwrite the newer dll's and other OS files that ship with your operating system. 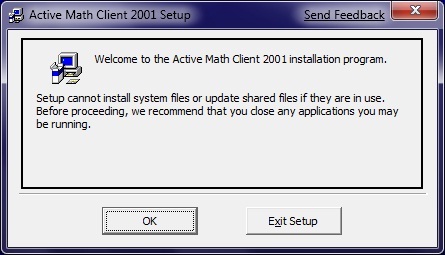 If you overwrite with the older files on the Active Math CD, Active Math will not only work on that computer, it will never work, unless you do a clean install of your operating system. When installing Active Math on XP, Vista or Windows 7, the dll's on your machine are later than those shipped on the Active Math CD. So whenever your are prompted to select keep or replace, you must opt to keep the (later) version already on your system. The following screenshots were taken during the installation of Active Math on the January 2009 public beta release of Windows 7. The above screenshot is what appears when you insert the CD. 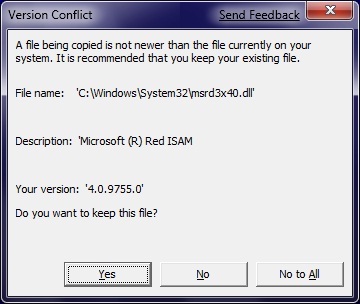 This screen (or one very similar) appears when installing on XP and later operating systems. 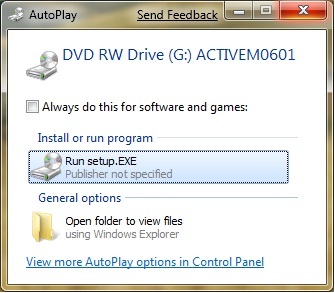 Choose the default option to rub setup.exe. The above screenshot and the next three date from the creation of the program, and appear when installing on all operating systems, from Win95 onwards. It is probably a good idea to exit other programs before running the install program. 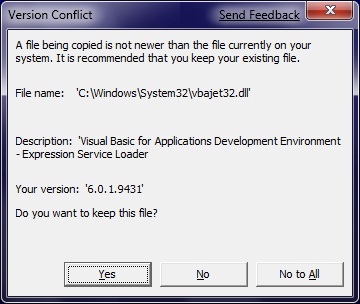 Then click OK to proceed with the installation. There is usually no need to change the installation directory, but whether you change it or not, jot down the location on a piece of paper. Then click the big install button (top left) to proceed. Again, unless you have a good reason to do otherwise, click continue to accept the default options. This is the first of 10 screens which appear when installing on the later operating systems, XP onwards. These screenshots are taken from Windows 7, and they may not be identical those which appear with XP and Vista, but the essential message here is always click Yes to keep your existing file. 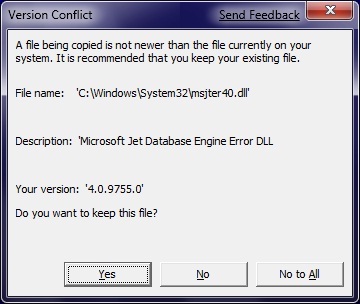 Click Yes to keep this file. 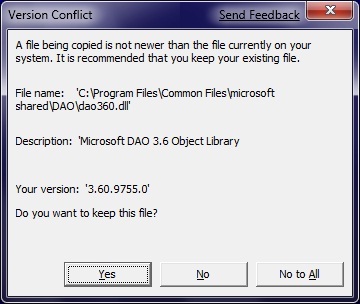 Click OK to complete the CD installation. Designed to run on a Win95 box with a 640x480 display, the hardware requirements are not onerous. Shipped on a single CD, the install package is less than 10 MB, of which the product executable is only 468KB. 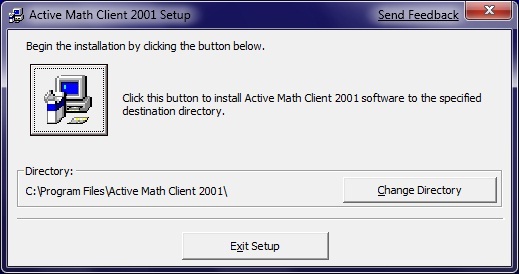 Active Math Lite installs from a CD on to a single PC. It is easy to use and is designed for families or very small organizations with only a single PC or a small number of PC's which are not networked. Active Math Professional requires professional installation. From the student perspective the product seems almost identical to Active Math Lite, but the database, which forms the back end of the product, is located on a file server. In this configuration, the front end application can be installed on a number of client machines in a lab or classroom, and regardless of where a student sits in the lab, his or her records remain intact, because they are all stored on the file server.